This past weekend at the NRA national conference in Houston, TX had hundreds of vendors sell their wares from guns, hunting accessories, gun related books, clothing, and practice targets. 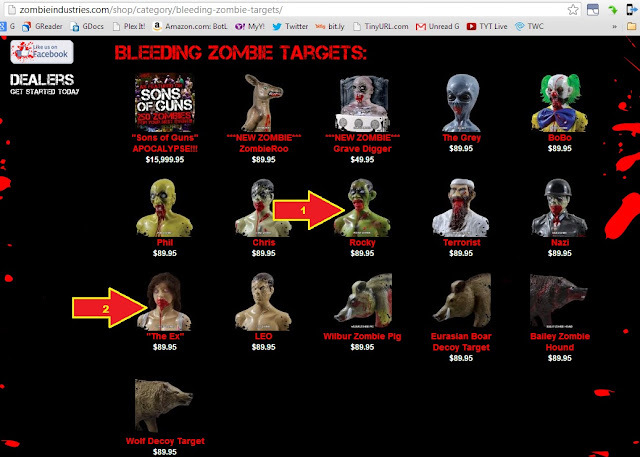 One of the vendors that sells practice targets that bleed when you shoot them, named Bleeding Zombie Targets by Zombie Industries. The NRA requested that take the Bleeding Zombie Target model named "Rocky" (which has user submitted videos on their website referring to it as "Barry") off display due to it's obvious resemblance to President Barack "Barry" Obama. They were free to continue to sell the less than respectful depiction of the Commander-in-Chief, the vendor was just not allowed to put it up front on display. This decision was in reaction to news reporting about the product, what strikes me is that no mention to the other model that clearly plays out on a fantasy of violence towards women named "the EX" and the only female target. So it is okay to carry out violence on exes effigy that bleeds faux blood, but it is beyond the pale to claim that conservatives have a war against women. So it is okay to carry out violence on the president effigy if he is a Democrat, but if Code Pink interrupts public appearances and calls judicial process being initiated to prove whether or not war crimes have been committed in our name-- that is demeaning to Office of the President. So moral relativism is an abomination when discussing public policy, unless it is American Exceptionlism because all countries are equal just some countries are more equal than others.